With world events and leaders no doubt making Shaw spin in his grave, it is a balm to reflect on the accomplishments of the ISS in 2017. The “Shaw at The Shaw” conference was a delight, our first ever at the Shaw Festival. Highlights included talks from the new artistic director of the Shaw Festival Tim Carroll and the noted Irish intellectual Fintan O’Toole, whose recently published Judging Shaw is a work worthy of a place on everyone’s bookshelf. Of particular note was the concluding round table of young(er) scholars who spoke with great passion about the future of Shaw studies. There will be no major conference next year, though we will do our usual Summer Symposium in July. I am looking forward myself to this brief respite but am also excited to think about (hopefully) our first continental conference. This year’s conference also marked the passing of several notable Shavian scholars, and we paid tribute to Christopher Innes. There will be some big changes in the next year, with our esteemed founding president and current treasurer announcing his “last year” in service as Treasurer. I hope that there will be a slew of volunteers to help lead the ISS into the future, but, for the moment, I am grateful for the ones we have. I am grateful to the executive board for their continued hard work, generosity, and good fellowship. I am grateful for Gustavo Rodriguez Martin’s regularly updated catalogue of all things Shavian, an on-going testament to the value and need for Shaw’s works and ideas made manifest. I am also grateful for Chris Wixson’s excellent stewardship and leadership as the recently appointed editor for SHAW and of this newsletter. As a hopefully brighter 2018 beckons us forward, I remain invigorated by the good work so many of you do. I have one more thank you to add to what our merry and pithy POTISS has already said, and that goes to David Staller. After regaling us at NOTL with a scholarly paper, David's Project Shaw's "autumn in New York" sparkled in new ways. As David completed his "Women Take the Stage" year (so named in anticipation of our first American woman President (sigh), he introduced his audiences to two suffrage-era plays directed by women: Rachel Crothers’s A Man's World from 1910 and Elizabeth Robins’s Votes for Women! from 1907. The talk-backs were filled with enthusiastic audience comments, and Wall Street Journal theatre critic Terry Teachout was featured for the Crothers evening and wondered how he did not know the play. Handbills for audience participation reading Votes for Women! delighted the audience. In between these two was Shaw's Captain Brassbound's Conversion, the play written for Ellen Terry in 1906. In mid-December, David took his audience back in time to 1893 for Wilde's A Woman of No Importance with Martha Plimpton and directed by Charlotte Moore, who has been the artistic director of the Irish Rep for thirty years. Moore and the cast were struck by Wilde's out-front feminist critique within the bounds of Victorian melodrama, and at least a couple of audience responders brought Crothers and Robins back into the conversation. Bravo, David, and thanks for letting me be in these talkbacks as Prof. but of course more importantly the face of the ISS. Happiest of holiday wishes for all of the ISS and hopes for all we hold dear as we turn the page to 2018. The Devil’s Disciple, Margaret Raether’s adaption of P. G. Wodehouse’s Jeeves in Bloom, and Noel Coward’s Hay Fever. See http://shawchicago.org. 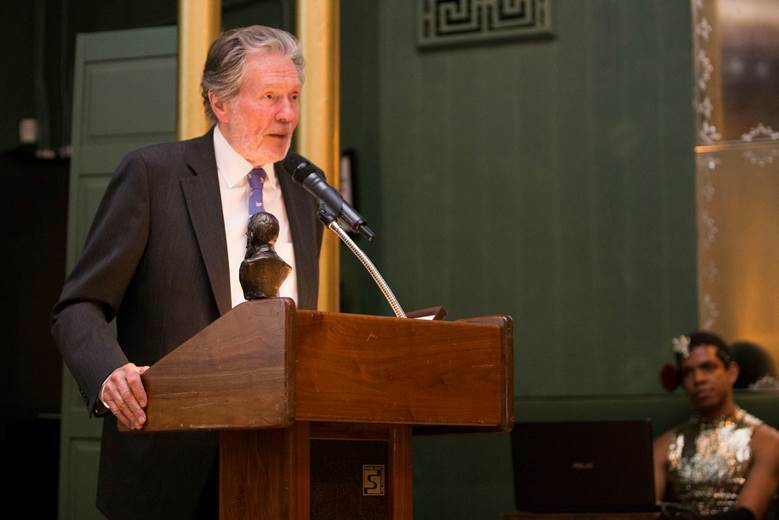 In other Windy City news, Jay Tunney was honored with a “Bernie” at their annual Gala in May for his support of ShawChicago. The award is presented to individuals and organizations “who have helped keep the works of GBS alive." The event takes place at one of the oldest private clubs in Chicago, The Casino, and includes a short performance, dinner, and live auction. On June 2, 2018, the International Shaw Society will receive a “Bernie” Award, and Richard Dietrich will be presented an individual “Bernie” upon his retirement as an officer of the ISS. The Gingold Theatrical Group (GTG), headed by producer and director David Staller, continues to stage a concert reading of one Shaw play per month at Symphony Space (2537 Broadway at West 95th Street, New York City). Celebrating “100 Years of Women’s Rights,” the 2017 season, the GTG’s twelfth, included Mrs. Warren’s Profession, Candida, You Never Can Tell, Press Cuttings, Getting Married, Captain Brassbound’s Conversion, and Shaw-related events.. For more information, contact info@gingoldgroup.org or go to http://gingoldgroup.org/project-shaw/. 3) SHAW IN WASHINGTON, D.C. 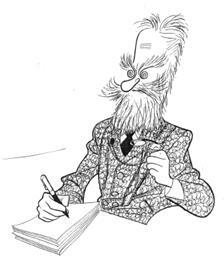 In 2017, the Washington Stage Guild produced Widowers’ Houses (28 September through 22 October) and “As Far as Thought Can Reach” (23 March through 16 April), the conclusion of their multi-year cycle of productions of Shaw’s “Metabiological Pentateuch,” Back to Methuselah, directed by the WSG’s artistic director Bill Largess. For information, go to http://stageguild.org/performances/. The 2017 Shaw Festival, the first to be led by Artistic Director Tim Carroll and the 56th in its history, featured Shaw’s Saint Joan and Androcles and the Lion, both directed by Tim Carroll. The 2018 season (4 April to 28 October) will include How He Lied to Her Husband and The Man of Destiny, both directed by Philip Akin, and O’Flaherty V.C., directed by Kimberley Rampersad. For further information about the Festival’s 2018 season, write to Shaw Festival, Post Office Box 774, Niagara-on-the-Lake, Ontario, Canada, L0S 1J0; or call 1-800-511-SHAW  or 905-468-2153; or go to www.shawfest.com. For information about summer 2018 performances of Shaw plays at Shaw’s Corner, Ayot St Lawrence, Hertfordshire, by Michael Friend Productions, contact Sue Morgan at Sue.Morgan@nationaltrust.org.uk or keep an eye on https://shawsociety.org.uk. The plays staged in 2017, its 26th season, were Major Barbara (23 to 25 June) and Too True to Be Good (21 to 23 July). Michael also took a couple of productions on tour, Press Cuttings to the Pentameters Theatre, Hampstead (7 to 26 March) and Too True to Be Good to the Sarah Thorne Theatre, Broadstairs (27 to 30 July). For a wonderful photographic record of many of these performances, go to www.mfp.org.uk/Personal/Albumpersonal.htm. For a delightful account of these productions, see R. F. Dietrich’s illustrated article “‘Shaw’s Corner’ as a Theater” in SHAW 31 (2011): 234-52, which in an Appendix includes a chronology of Shaw’s Corner productions from 1960 to 2017. Go to https://shawsociety.org/Shaw's-Corner-Theater.htm to see a version that has the photos in color and that provides an updated Appendix on the listing of productions of Shaw’s plays at Shaw’s Corner. The Shaw Society (UK) was founded in 1941, and its current president is Shaw biographer Sir Michael Holroyd. For many years the Society met monthly in Conway Hall in Red Lion Square, London, but recently it has announced that it will be shifting to a new venue at the Actors Centre just off Shaftesbury Avenue in the heart of the West End theatre district. Its official address is 1a Tower Street, off Earlham Street, London WC2H 9NP. It meets from January to June and September to November at 7:00 pm, for talks, lectures, and play readings. For more information and a sample issue of the society’s publication, The Shavian (edited by Anne and Martin Wright), click “Play Reading Group” at www.shawsociety.org.uk. You can subscribe to The Shavian when using the ISS membership form at www.shawsociety.org/2018membership.htm. The Bernard Shaw Society of Japan had another active year. Its Spring meeting was held at Sugamo Satellite, Jumonji University, Tokyo, on 10 June 2017. Shoko Matsumoto gave a paper entitled “Marriage and Divorce in Getting Married” that explored Shaw’s play through the lens of feminism; Nicholas Williams analyzed puzzling stage environments in a talk called “A Theatrical Web of Obscure Events and Equally Obscure Characterizations: An Interpretation of Too True to Be Good (1932)”; and Minoru Morioka, in “Philosophy of Life in The Man of Destiny,” situated the characterization of Napoleon within the evolution of Shaw’s Superman characters. The Society’s third Shaw Seminar took place at the Atami Dai-Ichi Building in Atami City, Shizuoka Prefecture on September 23rd and focused on the topic “Shaw and the Revolutionary in Fin-de-siècle London." A meeting of the Board was followed by a panel and discussion, chaired by Hisashi Morikawa. The roster of presentations included “The Budding of Socialism in Shaw’s Earliest Plays” (Tatsuo Ohtsuka), “Shaw and Fabian Society” (Minoru Morioka), and “William Archer’s Theory of Plays” (Ryuichi Oura). The autumn meeting of the BSSJ was held on November 25th at the Sakae Satellite Campus of Aichi Gakuin University,Nagoya. Papers presented included “British Society Experiencing Lamps: Light and Darkness in Heartbreak House” by Mika Matsumoto (analyzing Shaw’ splay in the context of the development of lighting technology); “Japanese Men Who Saw Suffragettes” by Kazumi Shimizu; and “Mrs. Warren’s Profession: A Well-Made Discussion Play” by Hisashi Morikawa (exploring the play within the tradition of both well-made and discussion plays). 1) THE 41st ANNUAL COMPARATIVE DRAMA CONFERENCE The Shaw session at the 41st annual Comparative Drama Conference (6 to 8 April 2017) at Rollins College in Winter Park, Florida, was chaired by Tony J. Stafford (University of Texas, El Paso) and included the following presentations: “Shaw’s Heterochronous Histories: Saint Joan and Beyond” (Lawrence Switzky, University of Toronto), “Shaw’s Creation of Alternative Spaces for Governance in The Millionairess” (Christa Zorn, Indiana University Southeast), and “Shaw and the Myth of Don Juan: The Strange Case of Richard Mansfield and The Devil’s Disciple” (Oscar Giner, Arizona State University). 2) The “Shaw at The Shaw” Conference was held at Niagara-on-the-Lake (21-25 July 2017), sponsored by the Academy of the Shaw Festival, York University, and the International Shaw Society. 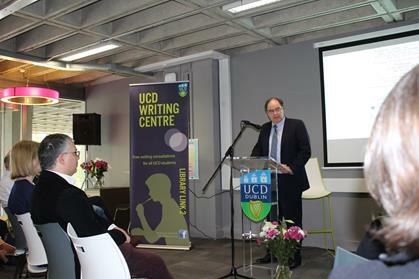 Featured speakers included Tim Carroll (new Artistic Director of the Shaw Festival), Thomas Postlewait (School of Drama, University of Washington), and Fintan O’Toole (Columnist, Literary Editor, and Drama Critic for The Irish Times). Special activities included two Shaw Festival theatrical performances (Saint Joan and Androcles and the Lion) and discussions with cast members, ten sessions of panel presentations, two Shaw-themed music recitals, and a concert reading of The Man of Destiny. “Utopia has always been a political issue, an unusual destiny for a literary form,” writes Frederic Jameson in Archaeologies of the Future. 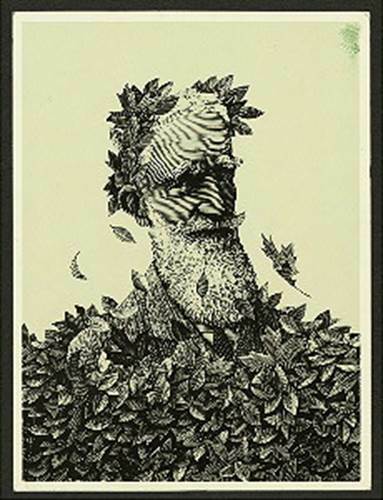 One writer Jameson takes up in his account of literary utopias is George Bernard Shaw, whose Back to Methuselah (1921) he reads as an optimistic allegorical account of class struggle in the waning days of the British Empire. Writing in 2005, Jameson detected a general resurgence in utopian thinking, which had been considered dangerous during the Cold War, and retrograde in progressive cultural movements predicated on the value of difference. 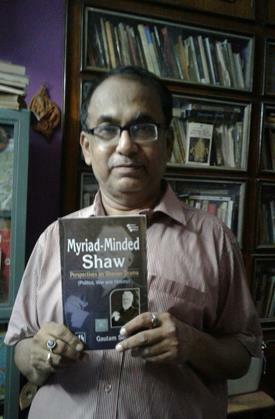 It is not surprising, then, that he emphasizes the progressive aspects of Shaw’s socialism, rather than the authoritarian sympathies and tendencies scholars such as Matthew Yde (2013) have detected in Methuselah and in Shaw’s writing more generally. Jennifer Buckley will be presiding over a Shaw Session at the 2018 MLA convention in New York City entitled “Revolutionary States: George Bernard Shaw, 1918” and featuring papers by James Armstrong, Virginia Costello, Ellen Dolgin, and Martin Meisel. For all the details see the website at https://shawsessions.mla.hcommons.org. 1) THE 41st ANNUAL COMPARATIVE DRAMA CONFERENCE will be held at Rollins College, Winter Park, Florida, from 5 to 7 April 2018. Please go to http://comparativedramaconference.org/ for details. This year saw the publication of and numerous events surrounding the publication of Fintan O’Toole’s Judging Shaw (Royal Irish Academy). There has also been much activity in Palgrave Macmillan’s new series, “Bernard Shaw and His Contemporaries,” edited by Nelson O’Ceallaigh Ritschel and Peter Gahan. 2017 volumes in the series include Bernard Shaw and Beatrice Webb on Poverty and Equality in the Modern World, 1905-1914 by Peter Gahan, Bernard Shaw, W.T. Stead, and the New Journalism by Nelson O’Ceallaigh Ritschel, Crimes and Punishments and Bernard Shaw by Bernard Dukore, and Bernard Shaw’s Marriages and Misalliances edited by Bob Gaines. Forthcoming volumes in this series include Joan Templeton’s Shaw’s Ibsen: A Reappraisal and Stephen Watt’s Bernard Shaw’s Fiction, Material Psychology, and Affect: Shaw, Freud, Simmel. 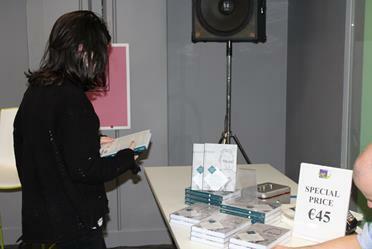 The launch of Nelson O’Ceallaigh Ritschel’s Bernard Shaw, W.T. 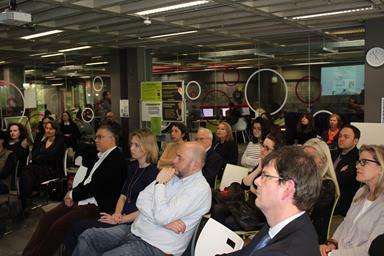 Stead, and the New Journalism at University College, Dublin. The discount code is ISSBC, entered at the checkout stage in the ‘basket’ when ordering. 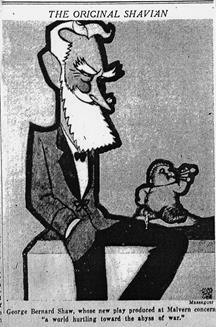 Perspectives in Shavian Drama (reviewed in SHAW 36.2). Also appearing this year was the ninth (and final) volume in the University of Toronto Press’s acclaimed “Selected Correspondence of Bernard Shaw” series (under the general editorship of L.W. Conolly), Bernard Shaw and William Archer, edited by Tom Postlewait, as well as an edition of recently discovered letters to Malcolm Watson entitled My Dear Watson: Bernard Shaw’s Letters to a Critic and edited by L.W. Conolly. SHAW 37.1 (June 2017) was a theme issue devoted to “Shaw and the Classics,” with Gustavo A. Rodríguez Martín (Universidad de Extremadura, Spain) as guest editor. SHAW 37.2 (December 2017) was an “open topic” issue featuring articles/book reviews. SHAW 39.1 (to be published in June 2019) will be a theme volume devoted to “Shaw and Music,” with Brigitte Bogar as guest editor. Submit abstracts (50 to 100 words) and papers to brigitte.bogar@gmail.com. SHAW 40.1 (to be published in June 2020) will focus on “Shaw and New Media” and be edited by Jennifer Buckley (University of Iowa). The issue will explore and assess Shaw’s engagements with nineteenth-, twentieth-, and twenty-first-century media and challenges the popular equation of “new media” with the digital by adopting the historically contingent definition of the term proposed by media scholars, notably Lisa Gitelman (1999, 2006) and Gitelman and Geoffrey B. Pingree (2003). This focus is prompted not only by Shaw’s various engagements with a wide range of nineteenth- and twentieth-century media — including the telegraph, telephone, photograph, gramophone, typewriter, film, radio, television, and mass print — but also by media historians’ and theorists’ sometimes brief but always provocative engagements with Shaw. For instance, Friedrich A. Kittler’s Gramophone, Film, Typewriter (1986) as well as Jonathan Sterne’s (2003) and Benjamin Steege’s (2012) respective histories of hearing and listening each employ Pygmalion as a foundational text. Shaw's ambivalent but extensive involvement with print media has also attracted scholars of material texts and print cultures, including W.B. Worthen (2004) and Elizabeth Carolyn Miller (2013). Others have recently begun to contest the widespread perception of Shaw as a (perhaps excessively) literary dramatist by documenting the prominence of Shaw and his plays in the early years of the public-service and commercial radio, television, and film industries. 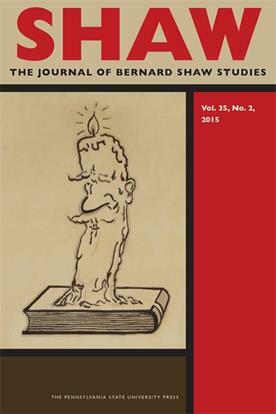 Inquiries about SHAW 40.1 and manuscript submissions (6000 words maximum) should be sent to jennifer-buckley@uiowa.edu, or mailed to Jennifer Buckley, 310 English-Philosophy Building, The University of Iowa, Iowa City, IA, USA, 52245. 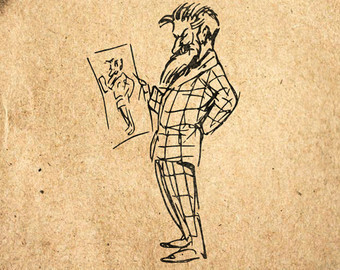 A Chronology of Works By and About Bernard Shaw is regularly updated and can be accessed at https://shawsociety.org/Chronology-of-Works.htm. A.M. Gibbs’s Chronology of Shaw’s Life can be reached at https://shawsociety.org/Shaw-Chronology.htm. Since 2014, Gustavo A. Rodríguez Martín (Universidad de Extremadura, Spain) has been collaborating with a computer programmer to develop an interface that will enable anyone to search Gustavo’s database without infringing on copyright restrictions (as most of Shaw’s works will not go out of copyright until 2020). To learn more about (and see samples of) this ground-breaking enterprise, go to http://shawquotations.blogspot.com.es/2014/09/digitizing-shaw-shaw-quotation-database.html and www.shawsociety.org/SEARCH.htm. In 2016, Gustavo A. Rodríguez Martín launched a Shaw Youtube Channel (www.youtube.com/channel/UCxGpZjHhix37VN-zFfX6psg/playlists). “A compendium of the best videos of and about Bernard Shaw and his milieu” is divided into the following playlists: GBS in Performance, GBS Footage, Lectures and Talks, Shaw in Film, Historical Context, Documentaries, and Miscellany. The GBS Channel brings together the multitude of videos: documentaries about Shaw, film footage of Shaw himself, film versions of his plays, and much more. Users are encouraged to suggest/submit videos that may fit any of the playlists. The indefatigable Gustavo A. Rodríguez Martín, with the assistance of former ISS membership secretary Ann Stewart, and Evelyn Ellis of the Shaw Society (UK), has created the GeoShaw map (https://shawsociety.org/GeoShawIntro.htm), a collaborative project that attempts to provide a geographical account of Shaw’s life via map markers of his travels, domiciles, meeting halls, and favorite vegetarian restaurants, to mention only a few examples of what’s available. Evelyn’s photographs of “Shaw’s Places Then and Now” can be seen at www.shawquotations.blogspot.com.es/2015/10/geoshaw-shaws-places-then-and-now.html. The Sagittarius-ORION Literature Digitizing Project at http://libra.apps01.yorku.ca is constantly expanding its open access section to make it a useful tool for Shaw scholars and fans. This include Reviews of Productions of Shaw’s Plays Around the World: 2015-2017: http://libra.apps01.yorku.ca/shaw-reviews-for-season-2015-2016/, 2014-2015: http://libra.apps01.yorku.ca/the-shaw-project-3/shaw-reviews-for-season-2014/, before 2014 at http://libra.apps01.yorku.ca/learn-about-our-partners-2/shaw-festival/shaw-festival-productions-reviews/. In addition, there is the Shaw Bookshelf featuring especially new Shaw books at http://libra.apps01.yorku.ca/the-shaw-project-3/shaw-bookshelf/. Educators may find the Education Programs in Theatres Around the World useful: http://libra.apps01.yorku.ca/canadian-theatre-companies/. A key attraction is the Virtual Tour of Shaviana at http://libra.apps01.yorku.ca/virtual-tour-of-shaviana/. Notable displays also include: 1) “Who is Bernard Shaw” written by Stanley and Rodelle Weintraub; 2) a calendar of productions of Shaw’s plays around the world; 3) theatre productions with links to reviews and videos of performances around the world; 4) Footsteps of Bernard Shaw, with videos showing Shaw’s world tour; 5) links to Al Carpenter’s Shaw Bibliography; 6) virtual tours of the late Isidor Saslav’s amazing Shaw collections; 7) links to updated Shaw holiday shopping; 8) links to numerous electronic Shaw texts; and 9) other classroom resources on specific plays. The restricted access platform continues to feature classroom resources, such as annotated full texts, study guides, reference materials written by Shaw scholars, an annotated bibliography, and concordances and a search engine. 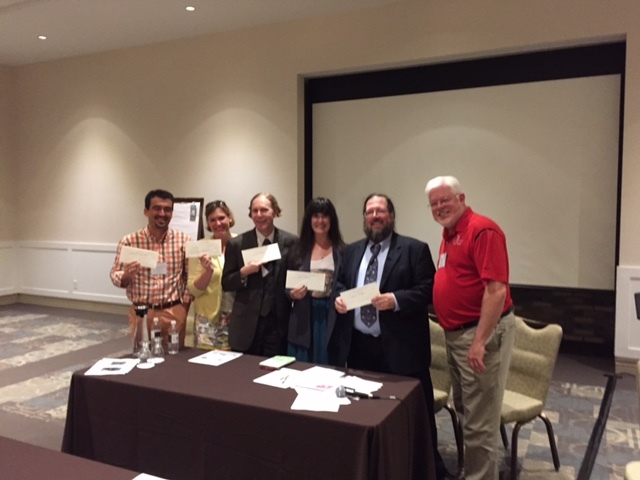 In the photo below, ISS President Michael O’Hara stands with the five ecstatic recipients of ISS travel grants to the “Shaw at the Shaw” Conference Symposium (21 to 25 July 2017) at the Shaw Festival in Niagara-on-the-Lake, Ontario: (L to R) Gustavo A. Rodríguez Martín (Universidad de Extremadura, Caceres, Espana), Valerie Murrenus Pilmaier (University of Wisconsin-Sheboygan), James Armstrong (City University of New York), Aileen Ruane (Université Laval, Quebec City, Canada), and Robert Stauffer (Dominican College of Blauvelt). TIME TO RENEW YOUR ANNUAL ISS MEMBERSHIP FOR 2018!! ISS Homepage: There are countless pages about Shaw’s life and works on, or linked from www.shawsociety.org, and many of them are continuously updated by ISS Webmaster R.F. Dietrich. Below is the list, year by year, of those whose “angelic” contribution to the ISS has gotten them written in the ISS Book of the Life Force by the Recording Shaw (with horns holding up his halo). These lists are linked as well from the ISS members page. Please take a few moments to view and acknowledge at www.shawsociety.org/ISS-Angels.htm.